If Leonardo da Vinci were alive today, he’d make a great marketer. Several years ago I spent a week cycling through the Loire Valley in France. It was a highly memorable trip filled with stress busting rolling hills by day, visits to beautiful chateaus and vineyards, and then getting cleaned up at night to enjoy a 5-course meal in yet another chateau, while sipping local Vouvray. One of my favorite chateaus, Clos Lucé in Amboise, was actually one of the most unassuming. It was the home of Leonardo da Vinci in the last few years before his death. Back in 1516, King Francis I of France invited da Vinci to Amboise and provided him with this modest (in those days) chateau to live and work. The King would host da Vinci at his own Château d’Amboise next door for food, drinks and long conversations about art and science. 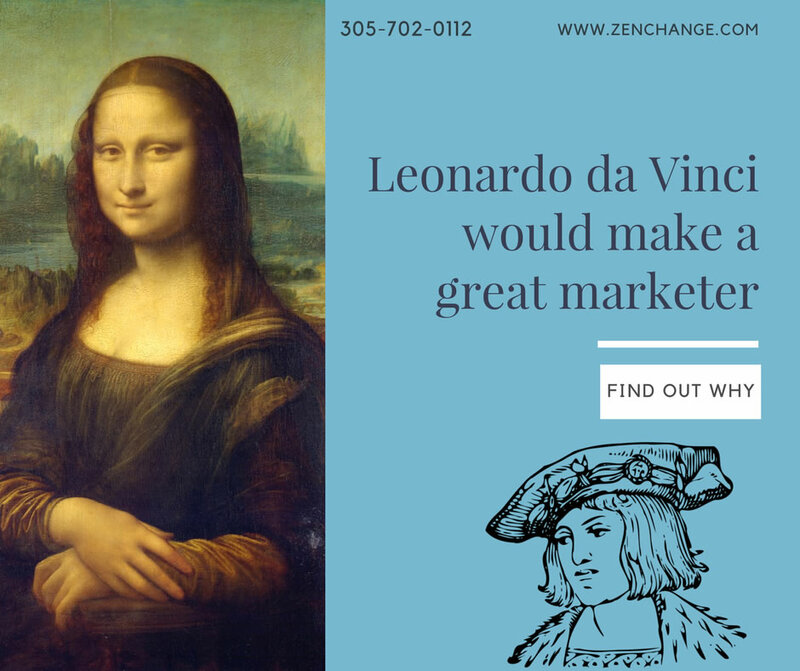 If the two were alive today, perhaps they would be discussing marketing strategy, because it is this blend of art and science that would make da Vinci a great marketer. How the Mona Lisa and the design for the first flying machine came from the mind of one man is truly amazing. In the old days, as in a few decades ago when I began my career, marketing was all about branding and advertising. He who had the prettiest logo and the biggest bankroll for TV ads and billboards won the race. Marketing was about looking as beautiful as the Mona Lisa and getting as many eyeballs on your work as possible. Then along came Peppers and Rogers in 1993 with their groundbreaking work, The One To One Future, with the premise that we were actually all unique human beings with our own tastes and desires and that as computing power was becoming cheaper and more available, we should all segment our databases into small groups and target our communications based on what people actually wanted to hear, especially the people most likely to buy from you. This eureka moment, while seemingly obvious now, was actually a pretty big deal at the time and I focused the next several years of my marketing career on CRM consulting by helping large corporations figure out how to define and target these tiny segments through decision analytics and predictive behavioral models. Marketing, meet science. CRM also led each marketer down the path of test and learn, which formed the basis for the A/B testing we use today to test response to particular marketing campaign creatives such as Adwords and email subject lines. A couple of years later, in 1995, Yahoo launched and information began to slowly become more available. Then in 1998 Google hit the scene and changed everything. Although launching with more academic intentions, Google quickly recognized its economic potential and in 2000 announced Google Adwords. As a marketer, the shift toward science had hit it’s next phase of evolution. To throw some more science into the marketing mix, in 2007, researchers began to investigate the application of functional MRI technology to market research. Marketers have learned over the years that people can’t always tell you what they want. As Steve Jobs was famous for saying, if Apple had asked people what they wanted they would not have come up with the iPhone. Even Henry Ford, an early marketer, was quoted as saying that if he had asked people want they wanted they would have said a faster horse. But with the fMRI, we can’t hide our secret thoughts…or at least the part of the brain we’re engaging. When hooked up to the machine and being shown images of ads for example, researchers can see the part of the brain that lights up in response to the stimulus. Neuromarketing techniques include tracking eye movements to see what we pay attention to, facial emotion coding to test our reactions, biometrics such as heart rate and neural measurements using an EEG and fMRI. So if you show me an image of a shiny red Ferrari and my eyes zoom over to see it, my heart beats faster, my eyes get wider and the pleasure center in my brain lights up, you can pretty much tell that I would like one. Unfortunately, science cannot yet tell the marketer whether or not I can afford to buy one with these methods alone. As a full service marketing firm, the blend of art and science is what sets ZenChange apart. You need a firm who can not only be your Warhol of websites and your Dali of design, but can also be your Sagan of social media and your Galileo of Google! If your online presence needs an artistic facelift, or if you haven’t applied marketing science to drive more leads, contact us for a free digital review. No obligation, just insights.